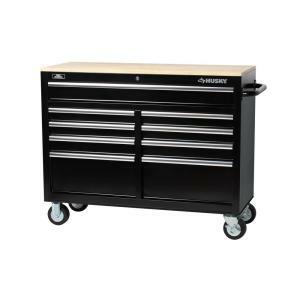 Home Depot has their 46" 9 drawer rolling tool cabinet on sale until next Sunday. It’s $199 (normally $398) and except for bolting the casters and handle on it’s all assembled. It’s heavy (200lbs). Casters are rated for 1200 lbs and drawers for 100 lbs so there’s no way you’ll overload it with your GF. Two swivel casters lock as well. The top is wood and 46"x18" so the GF will sit on top with some room on the side for your laptop or flatbed scanner. The height of the top is about 37" putting the GF at a nicely accessible height. The top drawer spans the width and will hold materials as large as the GF can take. The other drawers are a bit under 20" but are 15" deep so they’ll take fairly common sized 18x12 sheet goods. There are also 2 tall drawers in case you want to store stuff in bulk - the others are shallower so are good for ready access to stock. Not quite as good as one that’s purpose built with drawers or shelves sized to the GF bed but tough as nails and saves hours of construction time. Store and organize all your tools and hardware with this Husky Mobile Workbench with Solid Wood Top in Black. Easy to install. I have one too. They are real nice. An additional perk is that you will get LOTS of big sheets of cardboard from the box. Debating this, at least have a little time to decide. I bought one of these a year and a half ago for my office/studio. I’m very happy with it. I like how you put that ammunition away for an appropriate moment. $1 a lb for mine. Something like $75 a lb for those freaking muffin pans Sheesh. Who’da expect that? Now that I’ve bought this Husky Mobile Workbench (but haven’t picked it up yet), got a question about Glowforge dimensions. The mobile cart depth is 18.2" while the Glowforge depth is 20.75". Are there feet on the bottom of the GF and what is their distance front to back, and if not will the 2.55" overhang be a problem? Or do we need to add another slab top to this cart to safely hold the GF? If so that puts the top of the GF Pro at 53", which may not be a problem for us tall folks, but how about those who are vertically challenged? The depth isn’t a problem. There are long runners on the bottom going left to right that are set in from the front and back by several inches. Technically as long as the front to back distance is more than say 14" it will be sitting firmly on the runners. Now, the feet aren’t real tall. Is the top recessed? There might be another pic of the bottom floating around, but here are what the runners look like. You should be fine. If so that puts the top of the GF Pro at 53", which may not be a problem for us tall folks, but how about those who are vertically challenged? I like the higher height (& I’m 5’8"). I don’t like bending over a lot - tough on the back. I have a little step I’ll repupose for GF use for my wife - she’s 5’2". It’s probably fine unless you build one of those sound baffles @takitus designed. You could also reduce the height by swapping out the casters - I think the ones on it are 5 1/2" - it’s not like you’ll need the 1200lb rating of the casters it comes with. Just need to check the bolt hole position on any alternative set. Thats only 4’ 5". I dont mind my stuff being up a bit higher, but you cant lean on it and watch it while its engraving which I find myself doing all too often, so guess youd have to go for something smaller. Im really liking my shelves. Having so much space around it to keep my laser related tools and materials saves me a lot of time and searching. I honestly don’t know why I bothered to click the link… it read “Home Depot” and “Husky”. In Canada that translates to “charge an outrageous fee for our in-house brand” ($397 CAD). Or put a wood frame riser on the floor to stand on. I’ll probably change out the casters anyway. I like all 4 casters rotating so you can just put it where you want it and don’t have to jockey it in position. I bought one yesterday for my new workshop. I’ll be closing on the property this Friday, then the setup work really begins. Good point @lcronkite, as the tool box is still sitting in the back of the SUV until next weekend. Would be easier to put on four rotating casters from the start. Thanks, James - went by HD today and bought one - to be delivered on Saturday. Was thinking of adding a small lip to the back to prevent little things from rolling away. Does anyone know what the clearance of the runners under the Glowforge is? How high can I make the lip?